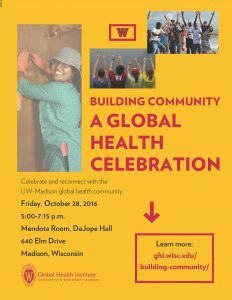 Join UW-Madison students, alumni and friends to celebrate UW-Madison’s contributions to global health, reconnect with old friends and meet new ones. Tickets cost $10 each and include one drink ticket. There’s a $5 discount for graduates from 2011 to 2016. No refunds will be issued after October 14, 2016. Register by October 20, 2016. The Global Health Institute hosts the evening celebration. GHI is a cross-campus collaborator that pulls together campus expertise to tackle today’s pressing global health challenges and is helping to educate a new cadre of global health leaders and scholars. More than 800 undergraduates and 172 graduate and professional students have earned global health certificates and hundreds have participated in global health field experiences around the globe. GHI has awarded more than 43 grants to faculty, staff, graduate students and visiting scholars to apply new ideas to solving global health challenges. Join us as we take a moment to reflect, to celebrate and to look toward new opportunities to ensure global health and well-being for all. Stay in touch with GHI. Update your contact information here to receive the latest news and events! For more information, email Kim Santiago or call 608-265-9608.